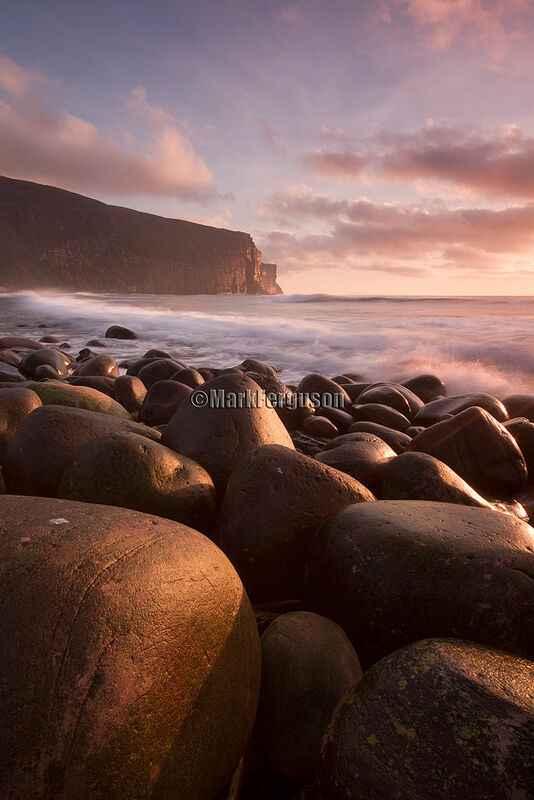 The island of Hoy, one of the Orkney Islands, is well known for its dramatic cliffs and towering sea stacks. However, hidden away on its north-western shore can be found a little-known, quiet and secluded rocky beach, flanked by cliffs on either side, which offers huge photographic potential in the right conditions. Rackwick Bay has a south-westerly aspect and so, even in summer, it can feel the full force of the Atlantic weather systems that regularly affect the north of Scotland. In a westerly gale it is very exposed, and sea spray can be blown a considerable distance over the foreshore onto the grassy hills behind. Huge, almost perfectly rounded boulders cover most of the foreshore apart from a pristine, sandy section on the southern side. To produce a stunning image of this location, a lot of pre-planning and analysis of wind, weather and tidal forecasts was required. I had decided that the winter months would provide me with the best opportunity to show off the rocky beach, as the setting sun would shine directly onto the beach, illuminating the boulders with glorious, warm, sparkling light. In order to capture the image I had in mind, namely blurred waves crashing against golden sunlit rocks, I had to make sure that the optimum wind, tidal and wave conditions all came together at the right time. I was hoping for a strong westerly sea-swell with a decreasing wind and bright, sunny conditions with some cloud. I definitely did not want a high tide, as this would completely cover the rocky foreshore. Of course, I had to wait months until the right combination of the above conditions looked likely to occur. When I did eventually travel over to Hoy one December afternoon, I was unable to get close to the shoreline because of sea spray and a strong wind; and so, although I took a few decent photographs, mainly of rainbows, my trip was in vain. Undeterred, I waited a further month until mid-January, when the conditions were again looking potentially favourable. This time I took the short passenger ferry from Stromness to North Hoy and then cycled the 6 miles to Rackwick Bay. I arrived around midday and had about three hours, before the sun set to the south-west, to get the image I had in mind. The weather was looking perfect, with the westerly wind decreasing as had been forecast, and so I was optimistic that I could get close to the shore and not be affected badly by sea spray. In addition, the tide was falling as predicted, thus revealing those wondrous, shapely boulders on the shore. I soon found a spot to set up my tripod, and composed my image to include all the necessary elements, namely, the boulders, breaking waves, distant cliffs and colourful sky. I used Live View on my Canon 7D, with an aperture of f16, and I focussed approximately one third into the image to get front-to-back sharpness. To balance the sky with the foreground rocks I used a 2-stop neutral density hard grad filter. In addition, I used a 3-stop neutral density filter to slow the shutter speed enough to achieve a pleasing blurred-wave effect. I tried both portrait and landscape formats and when I looked in my LCD I was confident I’d got the shots I was after . As I settled down to watch the setting sun dip below the horizon, I felt pleased that all my pre-planning and patience had rewarded me. For post-processing I performed a very slight curves adjustment, but nothing else. The bold, vibrant colours on the day did not require much enhancement. The final image, I believe, shows how sparkling and clear the winter light in Orkney can be.